This popular sheet metal tool quickly attaches to the chuck of a minimum 12-volt cordless or an A/C electric drill. Capable of 18 gauge capacity in galvanized sheet metal. Telescoping clamp fits large or small drill housing. For cross-cuts, lengthwise trimming and circular or square outlets in 30 to 24 gauge (0.31 – 0.61 mm) corrugated metal. Make your drill a double-cut metal shear. Now you can get double-cut performance in a versatile Malco TurboShear. Attachable vinyl siding cutter that attaches to corded or cordless drills for making straight cuts, circles, and squares. Attaches to corded or cordless drills for making straight or tight left cuts in asphalt roofing shingles. Now turn your power drill into a “Fiber Cement Shear”! 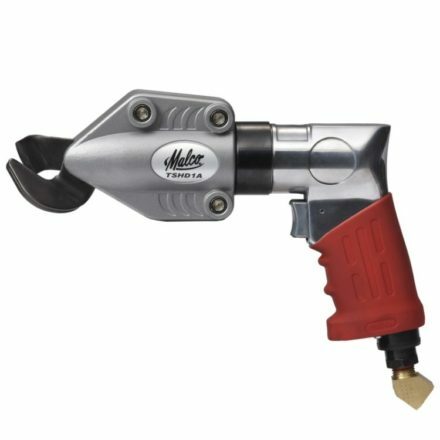 Malco’s unique TSF1 attaches to your existing cordless or A/C drill to go where the work is. Fast cutting blades are specialized for fiber cement siding only. Telescoping clamp fits large or small drill housing. Specialized for cutting 1/2-in. (12.7 mm) fiber cement siding or backerboard. 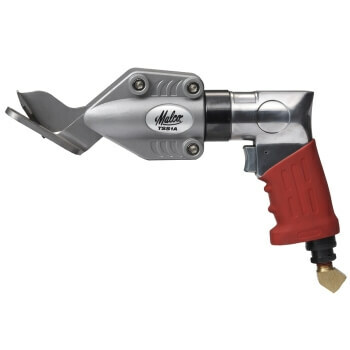 Malco’s unique TSF2 TurboShear attaches to your existing cordless or A/C drill to go where the work is. Telescoping clamp fits large or small drill housing. For an attractive hand-cut appearance, fast! Insert shear head into chuck of corded or cordless drill to make straight, angled or curved cuts in natural roofing slate. Telescoping clamp fits large or small drill housing. The original TurboShear sheet metal cutting tool. Quickly attaches to the chuck of a minimum 12-volt cordless or an A/C electric drill. A 20 gauge capacity in galvanized sheet metal. Fast, safe, precise cuts, 30% easier, all season long, in stone coated steel shingles, shakes and tile style roofing. The compact, offset AVsMini easily goes to work in tight spaces where full-size aviation snips are challenged. Offered in both a right and left offset cut. Aviation style sheet metal snips for straight cuts and slightly curved cuts in either direction. Power-Fit™ Performance Hand Grips with forged steel jaws, torsion handle spring and easy release side latch. Aviation style offset sheet metal snips for straight cuts and slightly curved cuts in either direction. POWER-FIT™ performance hand grips, easy release latch, forged steel jaws, and ergonomic hand guards. Left-cutting and right-cutting forged steel jaws are set at a 90-degree angle to allow easy gripping when cutting sheet metal in tight spaces or overhead. The Max2000 Offset Aviation Snips are offered in two handle styles, regular Max2000 and Max2000 Classic. Both handles provide superior hardened blade edges for “maximum” cutting life. Max2000 bulldog notching and trimming aviation snip with Euro-styled ergonomic handles. Max2000 distortion-free, double-cut aviation snip with Euro-styled ergonomic handles. 12 inch (31 cm) long aluminum handled snips with heat treated cutlery grade replaceable steel blades. 14 inch (36 cm) long aluminum handled snip with heat treated cutlery grade replaceable steel blades. The ULC10 Ultra Lightweight Metal Cutting Snip offers a light, yet powerful option for cutting aluminum, and 26 gauge steel. Forged steel snips for cutting straight, wide curves, and notches. Three types of forged snips from Malco include regular pattern, circular duckbill, and bulldog pattern snips.